The old house on Main street, Edgartown, which has been referred to as the Edson house, has received an official and appropriate christening. 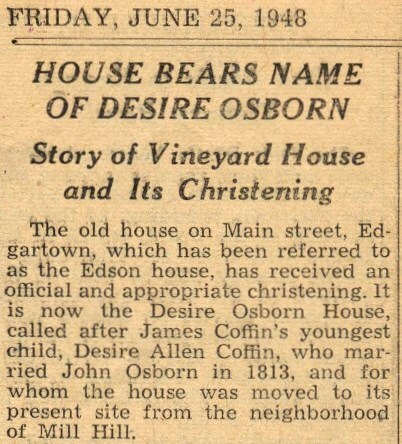 It is now the Desire Osborn House, called after James Coffin’s youngest child, Desire Allen Coffin, who married John Osborn in 1813, and for whom the house was moved to its present site from the neighborhood of Mill Hill. The property has been re-united with the former Coffin estate under the ownership of the North Water Street Corporation. The big house facing on Water street is named for John Coffin, founder of the line. The Main street house, long the residence of the Henry A. Edsons, has recently been occupied by Mr. and Mrs. Paul Covington. The Old Osborn House was moved from the Plains about 1800 by James Coffin who lived in the John Coffin House, which used to be Aunt Estey’s. James Coffin owned the land from the Four Corners to Pease’s Point Way. Uncle David Fisher owned land in the vicinity of the West Tisbury Road. The tract had been in the Coffin family and extended nearly to Mill Hill on which the Edgartown standpipe is located. Somewhere on this land the house stood. It was considered old in 1800 but good enough to move to the town for the home of James Coffin’s children when they started housekeeping. James Coffin’s youngest child, Desire Allen Coffin, married John Osborn, Sept. 19, 1813, and lived there some time. Her seven children were born there, 1814-1829. She always held her rights in the house and her descendants gained full rights. James Coffin’s youngest son was Allen Coffin, Aunt Estey’s grandfather. Laura Osborn Edson always told of the friendship between the Coffin and Osborn families. Her mother told of Dan Fisher and how kind he was in providing for her family when the husband was away on a whaling voyage. Her grandfather told how they divided the house with the young Dr. Fisher which shows that Allen Coffin still owned a right in the property. Laura said that Dan Fisher always had a gate large enough so they could use his back yard as a driveway when they didn’t care to use the main street. I remember Aunt Estey trading three or six old chairs with Laura for some dishes. Laura had the table and part of the china set of James Coffin. Aunt Estey had the chairs and part of the china set and wanted the full china set. They made a deal and everyone was satisfied.